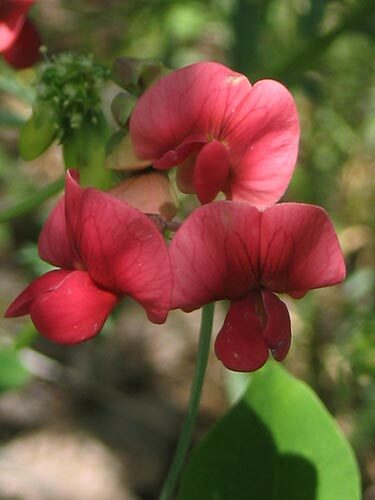 AgroAtlas - Relatives - Lathyrus roseus Stev. - Pink Vetchling. Perennial plant 80-150 cm tall with robust, numerous or single, erect, branched, angular stems. Stipules rather small, 5-15 mm long, semisagittate, lanceolate or subulate. Leaf petiole short, 5-10 mm long. Leaf rachis ends in thin simple tendril, that of upper leaves in a cusp. Leaves consist of 1 pair of orbicular-oval leaflets 2-4 cm long, 1.5-2 cm wide. Leaflets beneath lighter or greyish-green, obtuse. Peduncles thin, slightly longer than leaves. Inflorescence a rather lax raceme of 3-5 flowers. Pedicels thin, barely longer than calyx. Flowers about 1.5 cm long, corolla bright pink. Calyx campanulate, with unequal teeth (upper ones shorter than lower), all teeth shorter than tube. Standard rounded, narrowed into broad unguis; wings as long as standard, on thin long unguis; keel shorter than wings, triangular, on long thin unguis. Pods linear-lanceolate, channelled at upper suture, narrowed toward base and apex, 3.5-4.5 cm long, 5-7 mm wide, 10-11-seeded. Valves glabrous, with longitudinal and diagonal reticular venation. Seeds rounded, dark, smooth. 2n=14. Flowers in May, fruits in July - August. General distribution: Asia Minor. Former USSR: Crimea; Caucasus - Ciscaucasia, Transcaucasia. In montane forests and their fringes, among shrubberies. In mountains, reaches 1,500-1,800 m a.s.l. Galushko AI. 1980. Flora of the North Caucasus: Handbook. V.2. P.177. (In Russian). Grossheim AA. 1952. Flora of Caucasus. 2nd ed. V.5. P.405. (In Russian). Fedorov AA., Tzvelev NN., eds. 1987. Flora of the European part of the USSR. V.6. Leningrad: Nauka. P.165-166. (In Russian). Shishkin BK., Bobrov EG., ed. 1948. Flora URSS. V.13. P.489-490. (In Russian).